29th September at New Delhi and briefed him on the key findings as well as the need for formal regulations and disclosure norms to protect those who chose to move into retirement homes/townships which are a booming new sector that meets the changing requirements of society. The regulations should include prescribing minimum standards of infrastructure, service, contracts and protection (in the form of supervision, swift grievance redress and empowerment of residents) in line with what has been done by developed nations such as Canada, Singapore, New Zealand, Australia and others. The minister also discussed how financial products such as reverse mortgage could be encouraged among this set of residents to give them access to cash if they begin to run out of savings. Mr Puri readily agreed to have his officials consider how best to ensure the orderly development of such townships for the benefit of all stakeholders and enhance confidence in this sector. Simultaneously, at the initiative of Praveen Singh Pardeshi, additional chief secretary to the chief minister (CM) of Maharashtra, a working group is being set up to examine what needs to be done to encourage the growth of retirement homes, which cater to a growing market segment, and to put in place regulations that will protect their residents. The working group, which will include all stakeholders, is being led by Dinesh Waghmare, secretary, department of social justice & special assistance and includes BN Makhija (ex-secretary, GoI), Priya Khan (OSD, CM’s office) and representatives from ministry of urban development and department of social justice & special assistance. Moneylife Foundation is also a part of the group. Maharashtra wants to prescribe standards, ensure grievance redress, while avoiding needless red-tape and inspector raj, as also to ensure an independent rating of retirement homes to guide investors. The key findings of Moneylife Foundation’s study were as follows. Retirement homes are a new market segment with huge potential because a growing number of affluent middle-class Indians are looking to spend their retirement in a secure environment, with like-minded people of similar interests and without the burden of running a home. However, the sector needs effective regulation to ensure security and grievance redress. The need for regulation was underlined by a court case in the Tamil Nadu High Court that highlighted the travails of the senior citizens living in a retirement home in Coimbatore. with the residents to ensure that services, like nutritious meals, 24x7 security, well-equipped medical centre, comprehensive insurance, record maintenance, employee screening and policy for transfer of the asset, are provided by them. Hi, this is very much needed. I would like to point out that Paranjape Schemes created their Athashri homes in Bavdhan. From a real life experience of a 70+ year old couple who purchased and moved into this retirement home, nothing is as advertised. The food is really bad and the breakfast is not served on time. The transportation is pathetic and this poor couple was forced to hitch rides and get their groceries from miles away and finally resort to cooking. The lady was afflicted with cancer and passed away recently, but while she was alive she was in no shape to tend to household duties. Exactly the reason why they moved to Athashri in the first place, but their experience was very bitter. So a regulated retirement environment is very welcome because Paranjape Schemes is now going to town with another large retirement home scheme further down the road which will be many more miles away from Pune city center, and i shudder to think how they will hold some retirees welcome once they move in. Our politicians have left enough loopholes in the RERA legislation & rules to ensure that the Real Estate Developers (REDs) have enough leeway to swindle home-buyers. Hence, it's all the more important for the Govt to revisit the RERA & its rules to ensure that elderly people who invest most of their life's savings into a retirement home are not left high n dry, by unscrupulous REDs like DLF, Unitech, Indiabulls, who have vast political patronage (and investment of their illicit income too). But then, real estate remains the No 1 choice for 'investment' (read parking of illicit income) by politicians and corrupt officials, RERA is unlikely to be modified to favor home-buyers. Trand of nuclear family started, So concept of Retirement home emerged. But very full proof regulation is needed. Elderly are completely depend on managment of Retirement home. They can exploit them. There are two related issues-total apathy of both Central and state govts.,towards any relief to Seniors (10 crores plus) due to which Mushrooms 'Old age homes', Senior's homes get registered with Charity commissioner to enjoy 80G benefit. Some even insist that monthly charges-reciept will be issued as Donation. There are either no agreements or one sided agreements which empowers them to expel any member. The most worry some issue is that members can stay until they can manage their daily chores themselves failing which such members have to leave the premises. there are hardly any medical facilities, the quality of food served is not suitable for Seniors above 75 years as the management does not avail the services of an Dietician. Unless and until, Mody Govt. and state Govts. sincerely intrested to provide a care-free environment for Senior citizens, their plight will continue. This is from my personal experience as inspite of monthly payment of Rs.30,000/- for lodging and Boarding in a Exclusive Senior's home, no other facilities are provided and monthly charges are enhanced on the management 's whims and fancies. it's a one way traffic. The Current Prime minister is making Fool of mass Indians by making all sorts of commitments so that india is going to be again "sona ki Chidiya' by 2022. He has totally neglected rather ignored 10 Crore 'Seniors' and by 2030, india will be a country of 35% of its population of aged and by 2050 will grow to 50% of country's present population. Pm and his FM have totally ignored thousands of petitions of Senior citizen's associations and millions of 'Seniors' and perhaps thrown in the waste basket. Going Easy on Loan Defaulters: What Is behind the SEBI Move? Barely a month ago, Deepak Parekh, chairman of Housing Development Finance Corporation (HDFC) was all praise for the speed with which Ajay Tyagi, chairman of the Securities and Exchange Board of India (SEBI), had accepted his suggestion to get listed companies to mandatorily report to stock exchanges every default in payment to banks or financial institutions. Mr Parekh had told us that this move would give investors timely information, since there is a huge lag today before they get to know about financial difficulties of listed companies. On 4th August, SEBI issued a circular making it mandatory for companies to report any lapse on payment of interest or principal to their lenders. This was to become applicable from 1st October. The reporting requirement would cover default in payment of interest on loans from banks and financial institutions, interest/instalment obligations on debt securities (including commercial paper), external commercial borrowings (ECBs), medium term notes (MTNs) and foreign currency convertible bonds (FCCBs). SEBI said the move would fill a ‘critical gap’ in the information available to investors. Remember, while SEBI was all set to force corporates to disclose information about defaults, RBI has refused to name defaulters, despite a Supreme Court order. Consider how the SEBI circular would have affected banks. Bankers do not report defaults for at least three months and they are used to ever-greening accounts and delaying—as long as possible—the classification of loan defaults as non-performing assets (NPAs). By forcing companies to report payment defaults immediately, banks would no longer have the power to make a variety of adjustments, including offering fresh loans (or other forms of finance, including loans to group entities) to hide the NPAs in their own books. Public sector banks (PSBs) were already reeling under the pressure of bad loans when the national democratic alliance (NDA) came to power. The Congress—led United Progressive Alliance (UPA) had ignored the bad loans issue and routinely papered over a possible panic by doling out thousands of crores of rupees to recapitalise PSBs. NDA was expected to force them to clean up their books and stop their corrupt lending practices. But prime minister (PM) Narendra Modi began his innings by launching the Pradhan Mantri Jan-Dhan Yojana in August 2014. His stiff targets forced banks to divert almost all their energy into opening these accounts. Since many nationalised banks were also kept headless for a long time, there was nobody to ensure that core functions did not take a hit. Barely had the pressure about Jan-Dhan ended, when the PM announced demonetisation of Rs500 and Rs1,000 notes on 8 November 2016, once again plunging banks and the entire country into chaos for the next few months. Bad loans have now reached a crisis point, with stressed assets of the entire banking industry estimated at nearly 10% of all outstanding loans. The government passed the Insolvency and Bankruptcy Code (IBC) to help banks with faster loan recovery from wilful defaulters. But, as with all grandiose schemes disconnected with ground reality, there were two major problems. The first case of successful resolution under IBC, involving Synergies Dooray Automotive Ltd, has led to a complaint by Edelweiss Asset Reconstruction before the National Company Law Appellate Tribunal (NCLAT) calling it a fraud and a sham. Lenders took a 95% haircut in this case and there are grounds to suspect that an associate company of the promoter group has contrived to wangle control. The decision has had a huge hidden impact. Only in July this year, industrialists believed that the PM’s office was directly monitoring the 12 cases marked for insolvency action, where the outstanding debt is over Rs5,000 crore and 60% of it is classified as non-performing. A steel industry magnate told me that bankers were asked to ensure that at least six of these companies had a change in management. After Essar Steel’s audacious, but failed, legal challenge to the recovery process, the Synergy Dooray case and lower GDP numbers, the mood has changed completely. Three months later, the same source says that every defaulter company will sail through the National Company Law Tribunal proceedings with lenders taking a haircut and promoters retaining control either directly or indirectly. 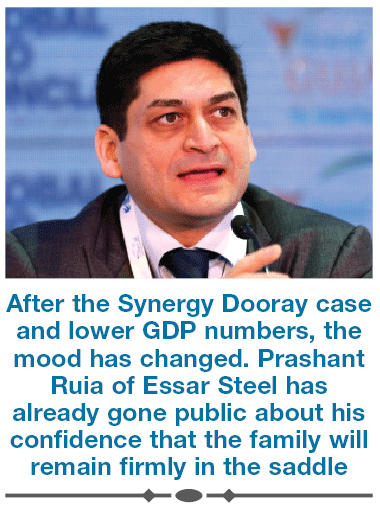 Prashant Ruia of Essar Steel has already gone public about his confidence that the family will remain firmly in the saddle. This has cast a shadow over the entire IBC process and raises concern about yet another mechanism to recover bad loans that may be doomed to fail. Was the IBC legislation pushed through in a hurry without taking the time to eliminate possible loopholes? There seems some merit to this disconcerting view, but it fits in perfectly with this government’s quick-fix approach. A bankruptcy legislation has a significant weightage in the World Bank’s Ease of Doing Business, which is due for a revision in October. Government mandarins rushed through the IBC legislation hoping for a 20-point jump in India’s rank, from 130 last year. India’s GDP growth, which was 9.2% in the third quarter of 2016, has steadily dropped to 5.7% in the April-June quarter of 2017. While companies were struggling to cope, the government went ahead with a complicated Goods and Services Tax (GST) with multiple tax slabs, onerous reporting requirements, frequent changes in rates and an online filing system that was not robust enough. While a simple GST would be beneficial in the long run, especially if we are able to move towards a single rate, at the moment, GST has caused a huge disruption, especially among exporters and traders. In this scenario, the instant reporting of defaults would force banks and rating agencies to take immediate action such as classifying loans as a default (with commensurate provisioning for bad loans) and downgrading of credit rating. All this would have had a big impact on loss-making nationalised banks, which are seeking a fat government bailout (or recapitalisation) at public expense. With the bull run of the Indian capital market having paused, in response to bleak economic numbers, a spate of rating downgrades would have only precipitated a further decline in share prices. A desperate government appears to have pressured SEBI to drop the investor-friendly move and allow the obfuscation by lenders and borrowers to continue. While institutional investors with large research teams have ways to ferret out information about corporate health, this move leaves retail investors at the mercy of sketchy disclosures made to stock exchanges. 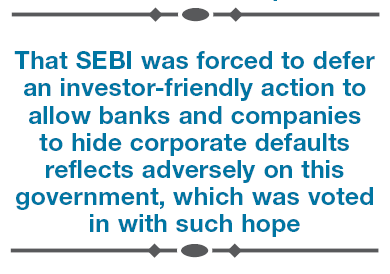 That SEBI was forced to defer an investor-friendly action to allow banks and companies to hide corporate defaults reflects adversely on this government which was voted in with such hope and expectation. What is worse, every problem faced by the economy today is self-inflicted. With low oil prices and a good monsoon after two years of drought, and enormous goodwill and support from the public, the government ought to have pushed for high economic growth, job creation and kick-starting investment supported by a clean and efficient administration. Instead, with less than two years for the next general elections and negative outbursts from its own party stalwarts, the government is in defensive mode and angrily attacking those who raise valid questions. secret will be out in public...and then.....what will not happen?! The Uday Kotak Committee set up by SEBI (the third such committee set up by SEBI over the last two decades) has recommended separation of powers of the chairperson or leader of the board) and chief executive and managing director (CEO/MD) or leader of the management, in phased manner to provide a better and more balanced governance structure. The Committee has recommended limiting directorship to a maximum of eight in listed companies. In addition, the Kotak Committee says from 1 April 2019, at least half of the board of directors should comprise of independent directors. "After deliberation, the Committee believes that the time is right in India to introduce a separation of the roles of the Chairperson and the CEO/MD for listed entities. The Committee observed that such separation, at least at the stage of introduction of the construct, may be more relevant where public shareholders constitute a large portion of the shareholding of a company. In this regard, the Committee considered various thresholds and concluded at least 40% of public shareholding would be an appropriate threshold. Further, in view of the fact that this would require a significant transition from the existing requirements, the Committee believes that listed entities should be given sufficient time to undertake such a transition," the Report from the Kotak Committee, submitted to SEBI says. The Committee recommended that from 1 April 2020, all listed companies that have public shareholding of 40% or more will have a chairperson, who is non-executive director. Once implemented, this will remain in effect even if the public shareholding of the company falls below the threshold level of 40%. "After 2020, if deemed fit by SEBI," the Committee says, "the above sub-regulation may be modified and from 1 April 2022, chairperson of each listed company would be non-executive director." To improve governance, the Committee recommended that every listed entity, irrespective of whether the Chairperson is executive or non-executive, may be required to have at least half its total number of directors as independent directors. "However, given that this may require significant changes to the composition of the boards, the Committee felt that appropriate transition time should be provided for effecting such change. At least half of the board of directors should comprise of independent directors from 1 April 2019, for the top 500 listed entities, determined on the basis of market capitalisation, as at the end of the immediately preceding financial year; and from 1 April 2020, for all listed entities," the Report says. Recommending to limit number of directorships an individual can hold to eight listed companies, the Kotak Committee says, "No person shall hold office as a director, including any alternate directorship, in more than eight listed entities at the same time of which independent directorships shall not exceed seven, with effect from 1 April 2019 and not more than seven listed entities with effect from 1 April 2020 provided that any person who is serving as a whole time director or MD in any listed entity shall serve as an independent director in not more than three listed entities." The Committee says it observed that while aspects relating to the composition and role of the board of directors of listed entities have been subjected to gradual reform, a holistic re-assessment is required to further strengthen the same. "Accordingly, this review by the Committee and the attendant recommendations seek to address aspects relating inter-alia to the size of the board and its diversity, separation of the roles of chairperson and executive management, attendance of directors at board meetings, ongoing updation of knowledge of directors and disclosure of their skills or expertise," the Report says. For any listed entity, a minimum of six directors should be required on the board of directors. Every listed entity have at least one independent woman director on its board of directors. I fully agree with the recommendations. Long overdue; there are yet many family related companies ,who yet " manage" to do what they feel suits them. In general ,MNC's are more compliant. I know from experience having being a Executive Director of a large MNC and heard/read about the other companies. Independence of board directors has been taken to mean only that there is no conflict of interest arising from financial or family ties. To get any such director to also take interest needs adequate compensation, which can create a personal financial interest where none existed before. He who pays the piper calls the tune, regardless of whether we're considering firms paying auditors, consultants or directors. Nitin Nohria was hardly a special case. For a better chance at an independent monitor, we need to consider an alternative way of matching directors to companies that is not itself fraught with more problems than benefits. Term limits for directors, together with some attempt at measuring directors' performance, could help. A director's incentives should not be driven by what he can get in future from the company where he is a director, but from some future directorship at an unrelated place. How do we create the kind of reporting and institutional framework needed to create such a market for corporate directors?